During the peak of last year’s plum season, Elise Bauer’s upside down cake recipe provided us with numerous delicious desserts. The apricots had been long gone, so I was eager to apply her excellent recipe to one of my favorite fruits. This year, it worked out quite well, thank you very much. 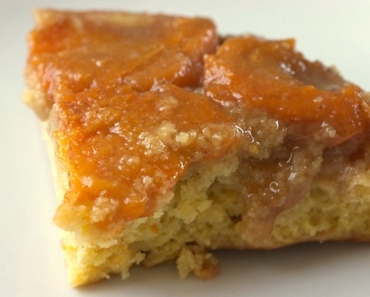 Rightside-up upside down apricot cake slice. It’s, uh, better looking when upside-down. There’s a big advantage of the upside-down habit of baking: the sponge doesn’t become nearly as soggy, like in the old apricot tart recipe. Score! Also, you can easily (er, lazily) serve this without turning out, if you want. Yes! Although serving the cake upside down does hide those mini fruit juice volcanoes which could develop while baking, not to mention display the fruits’ bright colors. Again, as in the original recipe, you can still use plums. When I do so, I quickly blanch them in simmering water, then peel them, since I’m not fond of the sharpness of their skins. If the fruits are large, I slice them into 1/2 inch thickness. Other untested fruit possibilities: peaches, nectarines, cherries, mangoes, etc. 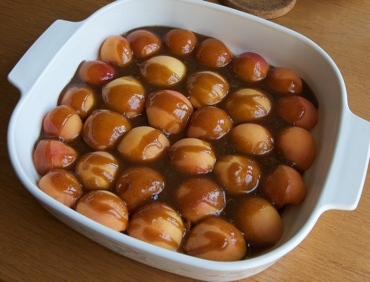 The next time I make this (more likely with plums, this year), I’m going to see if I can get away with using 3/4 to 1/2 a stick of butter in the sugar topping at step 2. Not sure why I need so much butter there. Update (9 August 2009): Yep, using only 1/2 a stick of butter in the sugar topping still results in a good cake! 3 to 4 ounces brown sugar; variance depends on the fruit’s sweetness. 16 fresh apricots, halved and pitted; unpitted, it’s roughly 1 1/2 pounds, give or take. 6 1/2 ounces pastry flour; unbleached (white) or whole wheat would be fine, or a mix of the two. 1/2 teaspoon vanilla extract; if you have vanilla sugar, use 1/4 cup as part of the 3/4 cup of regular sugar. Preheat oven to 350ºF degrees. Lightly grease the inside of a glass or ceramic dish. 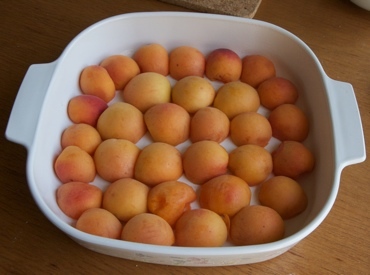 Place the apricots in the dish, cut side downwards, covering the base as much as possible. Some gaps are okay, though. Over medium heat in a small sauce pan, melt the 1/2 stick of the butter with the brown sugar, cinnamon and 1 pinch of salt. You don’t need to melt the sugar into a caramel; just gently whisk until there are no more lumps. Some of the butter might not emulsify; that’s also okay. Pour the sugar-butter goop evenly over the apricots. Sift the flour, baking powder and soda into a bowl, and set aside. Cream the remaining 1 stick of butter, another pinch of salt, sugar, vanilla (or vanilla sugar), and orange zest until fluffy. Slowly mix in the eggs. Slowly mix in the yogurt (or buttermilk). At this point, the batter may look mighty curdled. Fear not! Stir in the flour mixture, a third or a quarter at a time. The previously scary appearance at the end of step 6 will smoothen out. Gently plop the stiffish batter on top of the apricots. Smoothen out so that the fruits are all covered. Again, if there are a few small gaps around the edges of the dish, that’s fine, since the batter will spread in the oven. 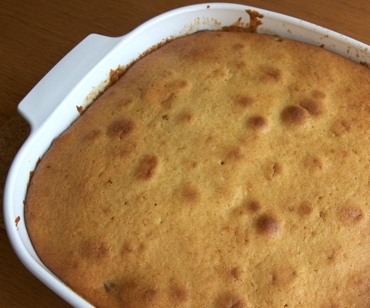 Bake until the cake has become golden brown; the sponge should no longer jiggle when shaken, and should be barely pulling away from the sides of the dish. About 50 to 55 minutes. Wait about an hour or so before eating, otherwise it’ll be too crumbly. The cake will shrink away and downwards as the fruit cools, but will remain spongey. Turn it right side up onto a plate, if you want. Tastes even better the next day! I store leftovers in the fridge when the weather’s hot. Leftovers are good at room temperature, or after being lightly heated in a low oven, or even after 30 seconds (per serving) in the microwave. At step 1: I trimmed out the ickier bruises and blemishes. At step 3: Brown sugar-butter mixture poured over the apricots. Upside-down upside down cake, hot out of the oven. This was written by sairuh. Posted on Monday, June 29, 2009, at 2:37 pm. Filed under Food. Tagged apricots, cake, recipe. Bookmark the permalink. Follow comments here with the RSS feed. Post a comment or leave a trackback. I made the cake with fresh prunes. I used half coconut oil and half butter in the cake (because I have coconut oil and it’s fun in cakes). It was delicious! I used coconut oil in the caramel, but that didn’t work at all – the water in the butter seems to be important in dissolving the brown sugar. I added some water to the caramel and that helped. Overall, the cake was wonderful. I didn’t try to invert it. I ate the whole thing myself!